We hold a maintenance session every second Sunday of the month (11am – 1pm), and every fourth Thursday (10am – 12pm). These sessions are when we look after the trees and check what needs to be done. For each season we will check the health of the trees, attend to any pests and diseases, and make the orchard look as beautiful as possible. It’s vital work to keep the orchard going and we rely on our volunteers to look after these trees, so we really appreciate the help. You don’t have to stay for the whole session, just come along when you can. All tools are provided. Superivised children are welcome but please note we have no toilet/hand washing etc facilities on site or nearby. Our traditional yearly celebration of our orchard and apples in general. Bring musical instruments or anything that makes a noise, decorations and ribbons for the trees. Wrap up warm and please park with consideration along the local streets. You might like to bring a torch as well. All ages welcome. The event is free but donations for the upkeep of the orchard are very much appreciated. Moth Night 2015 – Friday 11 September 8pm. Come to the Orchard at 8pm this Friday, where local expert Charles Turner (from Cambridge Natural History Society) will be luring moths down with a big light and a sheet. See how many different species we can identify this year. Obviously, wear warm clothes, bring a torch, and park with consideration on the local streets. Free event, donations appreciated. We will be finished (or in the pub) by 10pm. Come to the orchard and learn how to graft fruit trees. We will provide all the tools you need. Rootstocks are available to buy at £5 each, so that you can take home your newly grafted tree, ready to plant. We have a range of varieties to graft onto the rootstocks, or you can bring a scion (a thin straight new twig) from an existing apple tree that you have, so that you can increase your trees. 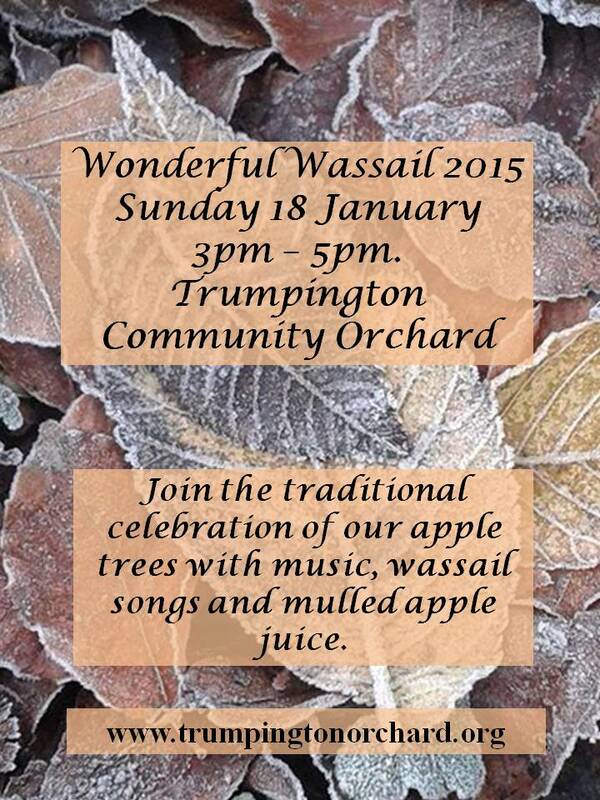 Our Wonderful Wassail will take place on Sunday 18 January 2015 from 3pm. Come and help us celebrate the apple trees and encourage them to bear more fruit in the coming year. If you are a musician, bring your instrument, and if you are more of a noisemaker, bring noise making things! Also bring a torch, and wrap up warm. There will be mulled apple juice to drink, and to share with the trees. Event is open to all, and free, but donations are very welcome. 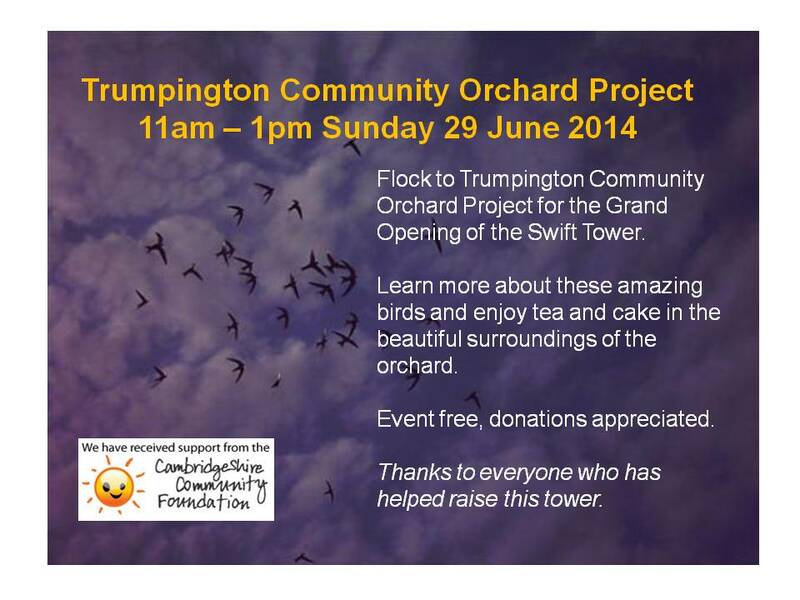 Date for your diary – Swift Tower Grand Opening Sunday 29 June, 11am – 1pm (2014). See the News Page for more information. The grafting event has been rescheduled for a later date (to be arranged) Due to the adverse weather conditions, the rootstock is not ready for Sunday. But we will be holding our maintenance session, including basic pruning of the apple trees. Watch this space or our Facebook page for the new date. Our next maintenance session will be a grafting workshop, teaching basic grafting techniques for fruit trees. We will demonstrate fruit tree grafting, allowing participants the chance to use cuttings from the orchard’s trees to graft on to suitable root stock. The cost of £5 per root covers the costs of the rootstock and other materials. Pear rootstock and scion wood is available for anyone more interested in pears. All tools including pruning knives will be provided for use during the workshop. You don’t need to have any prior experience – just turn up and have a go. Are you involved in running a community orchard project? Would you like to set up an orchard near you? If so, please register for our Community Orchard Conference. We will have speakers from the East of England Apples and Orchards Project as well as Peter Jackson, gardening expert, and speakers on biodiversity and orchard habitats. But the main focus of the day will be on letting those involved in community orchards talk to, and learn from, each other. Come and share your best ideas, learn from others’ mistakes and successes, and get stronger links with the network of community orchards across the region. We have introduced some maintenance sessions on Thursday afternoons, and look out for all our special events as well, these will be added to the list below. All events take place at the Orchard, unless listed otherwise. Open to families – accompanied children of all ages. Tea, coffee, small cakes available to buy. Come and make a lantern from colourful tissue paper, twigs and a lot of glitter, to hold during the Wassail the next day. All materials supplied. Join our Wassail celebration of the apple trees and help to ensure we get a good year’s apple growing in 2013. The Wassail will start at 3:30pm. Bring a light and wrap up warm to enjoy music, singing and some traditional mulled apple juice with which to toast the trees, and wish us all a good harvest. All ages welcome, free admission, donations gratefully received. Practical orchard horticulture session . Come along and help prune and tidy the orchard for the spring. All tools provided. You can stay for as long, or as short, a time as you wish. Basic training on all tasks will be given, so don’t worry if your gardening skills are a bit rusty. Practical orchard horticulture sessions – Every month on the second Sunday, throughout the year, we are open to all for an active session of orchard maintenance. This is your chance to come along and help to tend the trees and the plants on site. Don’t worry if you have no previous gardening experience, we will show you what needs to be done and provide all the tools needed. Accompanied children are also welcome.